Who does not love a free movie night? 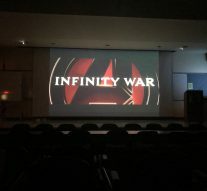 On Friday, the 25th of January, St. Petersburg College hosted a family friendly movie night showing Marvel’s Avengers: Infinity War. The Tarpon Springs campus invited students and their families to come and enjoy a free showing of the movie complete with free food and beverages. Students arrived between 6:45-7:00p.m. at the library, where the movie was originally supposed to be shown. Afterwards, they were directed to the LY building, where the showing was relocated. At 6:45p.m. the first two students walked in, and the teacher running the showing was nervous that the two students would be the only ones to show up. About ten minutes later, two other students and a parent arrived, and the movie began playing at 7:00p.m. The food provided at the event included pizza, beverages, and popcorn. 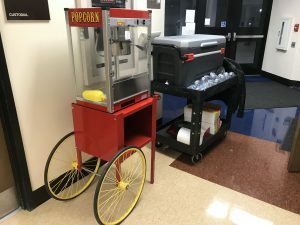 Although the popcorn was available, it was not made because the students chose to fill up on the numerous boxes of pizza instead. The variety of pizza choices included cheese, peperoni, and vegetable. Sadly, the school bought ten boxes of pizza, but given that there were only five people present, there were plenty of leftovers. After that, the students all sat down to enjoy the movie. The room that was made to hold over one hundred fifty people, held only five. The movie, packed with action and adventure, was thoroughly enjoyed by the students who attended. The room where the movie was held also had great sound and picture quality. These family friendly movie nights are a great place for students to meet and interact with each other. The school highly encourages students to participate in these events because they are a way to meet other students who share your interests. St. Petersburg College does not only show Marvel movies, but also a wide variety of popular cinema. Also, entrance and food are completely free. As college students, who have no money, a free theater experience is not something to turn down. The school is hosting another movie night Tuesday, Febuary 12th in the LY building showing the movie The Hate U Give. The school hopes that these events will become more popular and have better turn out in the future.